Water Heaters | Capital Plumbing, Inc.
At Capital Plumbing Inc., we know that when your hot water heater is not working effectively, it can be frustrating and overwhelming at the same time. With all of the different water heaters that are offered, it may be difficult to know what is the best option for you. Capital Plumbing Inc., has a licensed technician that can help with either getting your current hot water heater running, or make the best choice for your new hot water heater that will best comply with your situation. 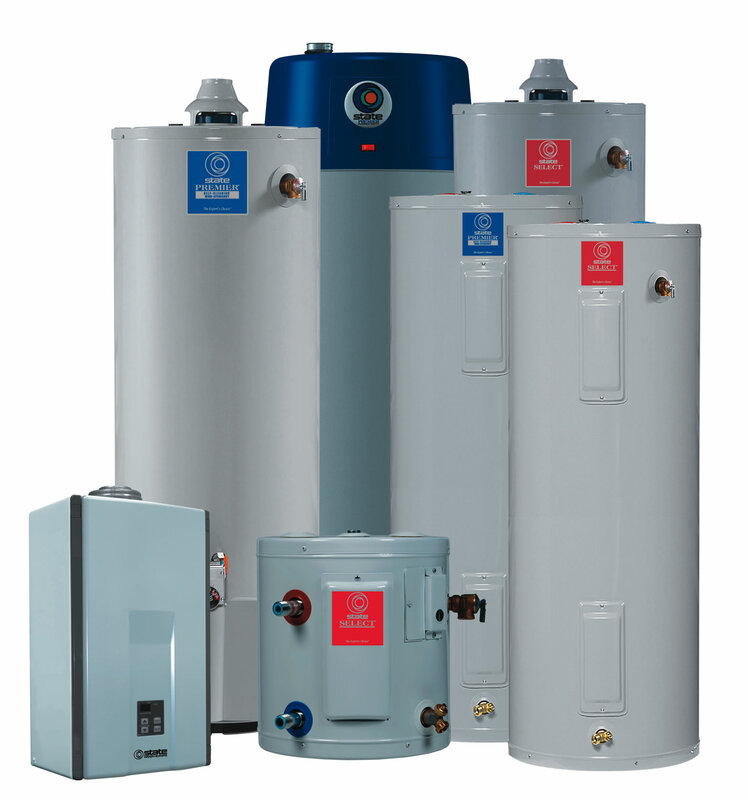 The different types of water heaters include traditional tank water heaters, tankless water heaters, electric water heaters and high efficiency water heaters. Traditional, gas water heaters range in sizing from 30 to 100 gallons. There are many different brands and models of the 40-gallon gas water heaters, in most cases they are almost identical. However, there are certain styles or types of construction that make a difference in a 40-gallon tank. All gas water heaters release carbon monoxide when they burn gas to heat water. Because of this all gas water heaters have a vent system that allows the carbon monoxide to exit the home. Depending on how your water heater is vented; either draft induced or power vented will determine the model you chose for replacement. Power vented water heaters require special venting and electrical power; this allows the heater to push or power vent the carbon monoxide to the outside of the building. Power vented water heaters are slightly more efficient than draft induced models, but are more expensive than traditional draft induced types. If you have a power vent unit now, it is important for safety reasons to replace it with a power vented model. Most water heaters are categorized by gallon capacity – how many gallons the internal tank will hold. On estimate, two to four people might use 80 to 85 gallons per day. That is enough water for roughly three showers, one laundry load, one dishwasher load, and using the faucet many times that day. Based on the recovery rating of the water heater a 40-gallon water heater is suitable for a 2 or 2.5 bathroom home. Endless Hot Water – Tankless water heaters heat water on demand, thus they do not run out of hot water. This type of water heating system can be useful for large families or for homes with larger hot water demands – for example homes with a soaking tub or spa system are often good candidates for a tankless system. If you are unsatisfied with your current water heater, consider converting to a tankless water heater system. While traditional storage water tanks are compared based on gallon capacity, recovery rate and first hour rating, tankless hot water heaters are compared based on flow rate. As long as the home uses hot water at a flow rate below the tankless heater’s maximum flow rate, there is endless hot water. Important to note: Tankless units do not provide instant hot water as hot water still takes time to flow from the unit to the destination. Energy Efficient – Tankless water heaters on average will save 20% to 40% on energy use compared with storage tank type water heaters. The most efficient tankless water heaters have a 92% to 95% efficiency compared to traditional gas storage tanks that operate at a maximum 62% efficiency. Tankless units typically operate at over 80% energy efficiency. Tankless water heaters save most energy because water is not constantly heated, cooled and re-heated like within a storage tank. Space Saver – Tankless water heaters are much smaller and are more versatile for installation. You can even hang them on the wall or locate them outside and they are about 1/4 of the size of a tank type water heater, this can free up space inside your home or garage. Long Life Expectancy – If maintained properly tankless water heaters can sometimes last twice as long as a traditional storage tank. Average life expectancy of storage tank water heaters is approximately 8 to 12 years. In our experience flow rate is the most important factor in sizing your tankless water heater. Tankless units heat water on demand (when you open your faucet) unlike traditional storage tanks that heat when the tank temperature drops below a set point. Tankless water heater sizes are measured by their per minute flow rate rather than by their gallon capacity. Most tankless water heater manufacturers offer several models to meet different flow rate needs. Flow rates for most major brands range from four to eight gallons per minute. Typically, the smaller four to five gallon per minute water heaters are suitable for smaller apartments and small one bathroom homes. For single family residences with two bathrooms or more, we strongly recommend installing a six to eight gallon per minute unit. These tankless water heaters are designed to service two or three applications at the same time. For very large homes, restaurant or other commercial applications there are many other options including installing multiple tankless units in series. Electric water heaters are available in gallon capacity sizes for 2.5 gallons up to 120 gallons. They are very versatile and can be installed in almost any location as long as there is a water supply and the correct electrical supply. Residential electric water heaters generally range from 30 gallons to 52 gallons. For large homes or when solar systems are present capacities range from 66 to 120 gallons. Residential electric tanks typically have a 240-volt electrical connection. In commercial businesses such a gas stations and office buildings we often see smaller point of use units in 2.5, 5, 10, and 20 gallon capacities installed. This type of water heater provides a small amount of hot water and can be installed directly at the fixture. These water heaters come prewired with a 120-volt connection and can be hardwired or plugged in depending on the application. Larger and more powerful commercial electric water heaters range from 2.5 to 175 gallons. They also come with a wide range of electrical options. Tanks can be wired from 3kw to 90kw depending on the need. They are also available in 120-volt, 208-volt, 240-volt or 480-volt wiring. These water heaters are designed to provide high volumes of hot water. Gas condensing and electric heat pump style units are more efficient than most tankless water heaters. Upgrading to a high efficiency water heater will cost more upfront than replacing a traditional type water heater, but they save more on energy costs in the long run. Often times they will produce more hot water, but not take up any more space than your old water heater.